I had recently run out of my holy grail foundation, Estee Lauder Double Wear so I was really excited to find out that there was a Macy's gift with purchase (GWP) going on. The GWP includes 7 items that are valued at $120. 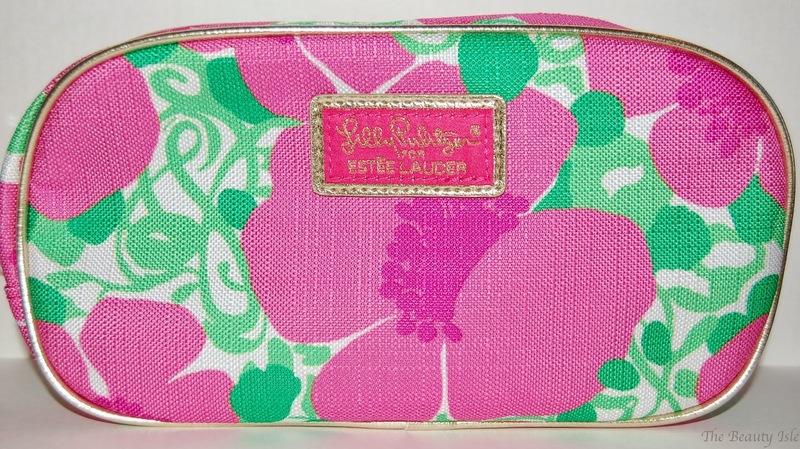 Macy's collaborated with Lilly Pulitzer again for the cosmetic bag and it's absolutely gorgeous. I chose the "bold" makeup shades. The shadow colors are gorgeous and I love the shade of lipstick. I've used the deluxe size samples of the Advanced Night Repair in the past and this product has always improved my skin. This is a wonderful GWP so if you were thinking about taking advantage, think no more and get yourself to Macy's! I'd also like to tell you about a new foundation and skincare selection tool on the Macy's website. After 3 or 4 questions depending on the tool you are using, the calculator helps you identify the perfect skincare product or foundation type for your skincare and beauty needs. This is just like the tools that consultants use at the counter and it's right at your fingertips! If you're new to Estee Lauder skincare products or foundations definitely use this tool to help you out and don't forget that if you spend $35 you get the amazing Lilly Pulitzer gift with purchase! You'd better hurry though because the GWP offer ends on March 23rd. Did you get this gift with purchase? Have you tried the Double Wear foundation?? I remember you telling me about this! I'm glad you mentioned the foundation finder...heading over to the website now! This is a great GWP! I don't need any foundations...I have about 7 right now...but I'm dying to try this one. Thanks for sharing! I know, I have so many foundations right now too but if I have a long day or if I have social plans at night the Double Wear is 100% my go to. Thanks for reading! looks like it's time I picked up some of those high end lipsticks I've been eyeing :) Thanks for letting me know about this!! Awesome, let me know if you get the GWP! What a fantastic gift with purchase. That bag is super cute and all the samples seem great. Thanks for telling us about the foundation finder and the skincare finder. Those are awesome! Thanks for sharing doll. 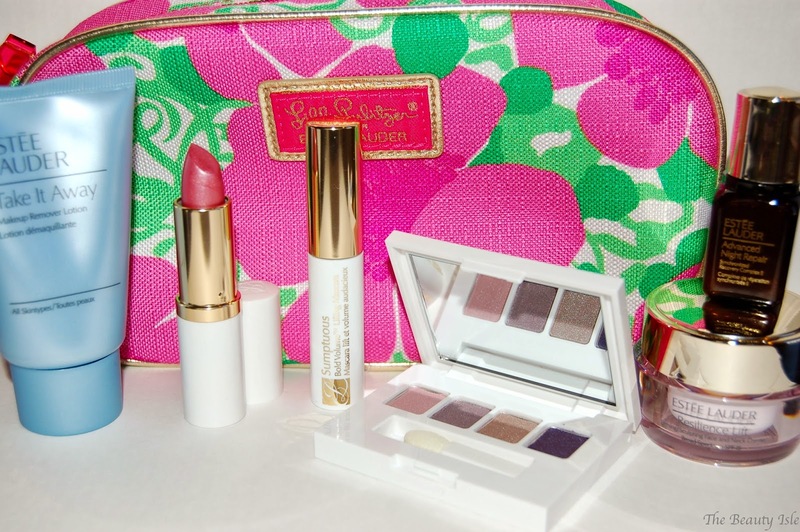 Yeah, it's a pretty good GWP and the bag is soooo pretty! Thanks for stopping by girl! I so want to pick up that foundation! I went to the mall Sunday & I completely forgot! Right now I'm really into my Revlon Whipped Foundation again, & I'm testing the new Rimmel foundation. I don't think I've ever tried anything from EL, & this GWP looks great. Love the bag too! Well it's a perfect time to try something out from the brand! I think I've said it before, I never buy department store brand makeups unless there's a GWP and this is a great one! I know, we are eye shadow addicts lol! Yeah I've been buying from them for years and I'll only ever do it if there's a GWP. Thanks for reading! Yes, it was a great GWP! Thanks for visiting! Oh my gosh the bag is SO cute!! !